Hey y’all! We’re back to share a simple fall tutorial that you can whip up in no time and probably have all the materials on hand to create. The original idea for this cute canning ring pumpkin was created by the talented Kristin of Yellow Bliss Road, but we’re putting our own little twist on it by making our new canning rings look aged when they’re actually new from the box. Take a look at our version, and follow along to make your own! This was an easy peasy project and took about 15 minutes to create, including dry time. String bakers twine around the canning rings like a necklace. Tie tight, but not too tight as you need a smidgen of wiggle room for the stick. Paint a light coat of brown acrylic paint, then orange (sorry no pic but I just dabbed it over the brown) loosely on the canning rings. 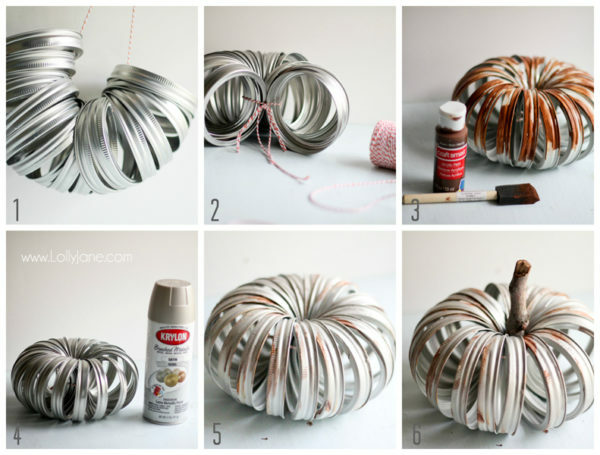 Give the entire pumpkin a light coat of spray paint. Slightly distress with a fine grit sandpaper until the brown-ish orange just peeks through. Add your stick (or cinnamon sticks) and viola! Seriously easy, seriously cute. That’s how we roll this crazy busy time of year! LOL! You girls are so sweet and I LOVE your version! Thanks for the shout out! !